Any patient who remains immobilized for long periods in a bed or a wheelchair is at risk for developing bedsores. Bedsores, or pressure sores, are the result of continuous pressure applied to an area of the body. Normal, healthy people relieve pressure on various parts of their body naturally, without thinking about it. This prevents pressure sores from developing. When patients are unable or less likely to relieve this pressure themselves, trained staff must do it for them. More commonly called bedsores or pressure sores, decubitus ulcers are areas of the body where skin and tissue has died and worn away. Any time a blood flow compromise occurs in an area of the body, the affected tissue will begin to die. When constant pressure to the area is the reason for this restricted blood flow, the resulting wound is called a bedsore. Stage I. There is no breaking of the skin as of yet, but the affected area is unnaturally red. The sore affects the skin, but it has not died. The skin and underlying tissue may also be hard, warm and/or swollen. Stage II. The outer layer of skin has died. There will either be an abrasion or a blister. The underlying tissue and deeper layers of skin are not yet necrotic, but the infection risk is elevated. Stage III. The skin has worn away and a crater reaches down to the underlying tissue. The tissue, now visible to the naked eye, is damaged. The infection risk is now severe. Stage IV. Not only the skin but now the underlying tissue has died and worn away. Beneath this, one can see the muscle and possibly the bone. An infection is virtually certain if steps are not taken. Stage IV is considered life-threatening. Paralyzed patients or those in a coma are typically at the most risk for developing pressure sores. However, other patients are also at risk. Some elderly patients lack the strength to move themselves and bedsores develop. 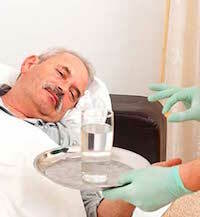 Gravely ill patients, whether elderly or not, are also a risk for developing bedsores due to a lack of energy. Diabetes patients also present a special risk. While their ability to move may not be compromised, the sensation in their extremities might be. Without this signal, they may not realize that they have to move and relieve the pressure on their bodies. Smoking. Smoking is known to inhibit the body's ability to heal wounds. Once a pressure sore starts to develop, it can progress more quickly in smokers. Diabetes. Like smoking, diabetes usually reduces the body's natural healing powers, especially in more advanced stages of diabetes. Atheroma. Plaque buildup in the arteries is not just a heart attack or stroke risk. It can reduce blood flow everywhere, meaning a patient is more vulnerable to applied pressure than they would otherwise be. Dehydration. Hydration and nutrition are important for skin health and healing. Dehydrated patients are more susceptible to bed sores because the skin and tissue can die more quickly. Incontinence. For the same reason that we must change babies' diapers, patients should not lie in their own urine and feces. Wet skin is more likely to suffer abrasions, which occur in Stage II pressure sores. When feces is present, abrasions are more likely to get infected. There are many devices that can assist in the prevention of decubitus ulcers, such as heel boots and pressure relieving mattresses. The first line of defense, however, is an attentive nursing staff that frequently turns their patients. Why is ‘turning’ so important to prevention of bed sores? What steps can be taken to minimize the risk of developing bed sores?